The only woman selected for a controversial class of Los Angeles Fire Department recruits has resigned in the latest setback to a decades-long effort to increase the number of women in the department's ranks. Erica Juergens was among 70 recruits who entered training in January. She resigned Monday, citing personal reasons. "I didn't feel like it was ultimately the job for me," Juergens said in an interview Wednesday. "But I was very welcomed and offered support and encouragement along the way." The Fire Department has struggled to overcome a legacy of discrimination and bias complaints that have cost taxpayers millions of dollars in legal payouts in recent years. About half of all uniformed employees are white, while the city is 29% white. And despite repeated efforts at reform, the percentage of female firefighters remains slightly less than 3% — the same as in 1995. Yusef Robb, a spokesman for Mayor Eric Garcetti, said the office was not aware of the reasons for Juergens' resignation. But her departure underscores the importance of hiring and retaining qualified female firefighter candidates, Robb said. "We can debate what percentage of female recruits is possible, but 0% is absolutely unacceptable," Robb said. When Juergens' class was announced, Garcetti criticized its makeup, which was 60% white and included one woman. The mayor said it failed to make progress toward a goal of having the LAFD be more representative of the city. 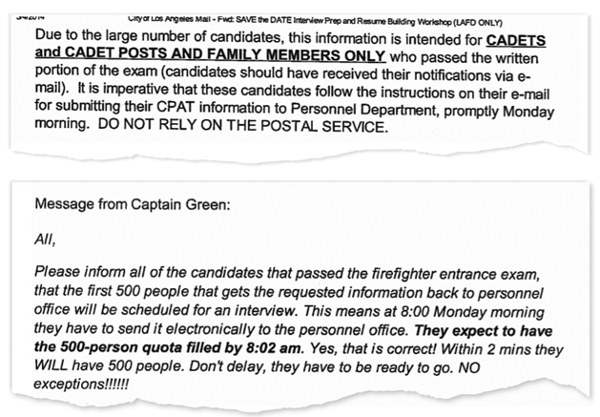 After a series of Times reports on the screening system used to select the recruits, Garcetti suspended the hiring process last month, calling it "fatally flawed." Among other things, internal emails show that dozens of department officials were alerted to information that could give their relatives an advantage in submitting key paperwork to personnel officials. In the end, nearly 25% of a class of recruits who began their training earlier this year were related to LAFD firefighters. The mayor halted hiring from a current pool of candidates for new classes. Recruits who were hired for the class that began in January continue to train at the LAFD drill tower in Panorama City. Members of that group who complete the Fire Academy are expected to be assigned to firehouses later this year. The city has asked the Rand Corp. to help overhaul screening and hiring of firefighters, as well as examine the practices of the training academy. "We want to make sure we hire the most qualified firefighter candidates possible and maximize their chances of success," Robb said. A spokesman for the LAFD said Wednesday that the agency had not studied retention of female firefighters and declined to comment on Juergens' resignation. "The Los Angeles Fire Department's training academy is both rigorous and intense," spokesman Peter Sanders said. "Regrettably, some recruits are unable to complete the training and leave the academy prior to graduation. As these are personnel matters, the department will have no further comment." Controversy has previously surrounded the treatment of female recruits at the LAFD drill tower. In the 1990s, an hourlong video — dubbed "female follies" — was made from footage shot by a captain at the drill tower showing women struggling to perform certain tasks. The video was circulated at a number of firehouses and watched for entertainment, according to a city investigation. About the same time, a city audit found that women resigned or quit during training at roughly twice the rate of male recruits.